A combined team of soldiers and police operatives yesterday rescued a petrol dealer, his wife and six others abducted last Friday. 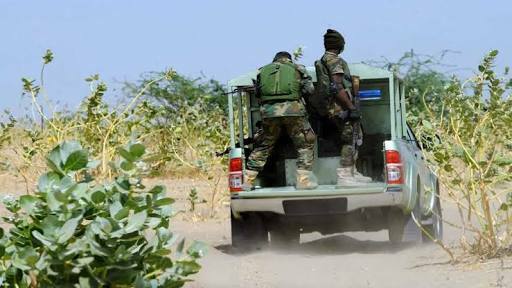 The soldiers and men of the Operation Flush from Ekiti State Command were said to have invaded the expansive forest where they were held hostage. A source said there was fierce gun duel between the security men and gunmen before the breakthrough was recorded. The source said: “They requested for N20 million ransom from the oil dealer, which they later reduced to N15 million. “They were constantly making contact with the family of the oil dealer on the deal. “As of this morning (Saturday), the family could only raise a sum of N1.2 million and that was the situation before the soldiers and police stormed the forest and secured their freedom,” he said. The petro dealer identified as Mr. D. Alalade and his wife were seized at about 4.00pm at a location between Erik and Economic by gunmen wearing military camouflage. Alalade is the manager of one of the outlets of BOVAS Petroleum and Gas Limited in Ekiti State. The 32 Artillery Brigade of the Nigerian Army, however, said its troops rescued ten persons from the kidnappers. A statement yesterday by Assistant Army Public Relations Officer, Major Ojo Adenegan, said the rescue operation was carried out after an exchange of gunfire between the soldiers and kidnappers. It reads: “The troops of 32 Artillery Brigade in continuation of its clearance operations at various flash and black spots in Ekiti State have rescued ten kidnapped victims inside a forest at Erio – Efon Alaaye road. “The victims were kidnapped on their way to Ado Ekiti from Efon Alaaye in two commercial buses at different points. “The information got to our troops who were on intensive patrol where they quickly responded by combing the forest and had exchange of fire between our troop and the kidnappers who later fled as a result of fire power against the kidnappers. “The ten victims who were at the kidnappers’ hostage were rescued safely without any injury. “Men of the Nigeria police from Efon Alaaye also participated in the operation. The Nation reports that many kidnapping and robbery incidents have been recorded at the forest belt between Efon Alaaye in Ekiti State and Erinmo, a community in neighbouring Osun State. At least three persons were killed by suspected gunmen two weeks ago while many others were kidnapped. The Nigerian Army formation in Akure, Ondo State, last week raided the forests in the area with human skeletons believed to be those of kidnap victims discovered. Some motorists and commuters travelling to Ife, Ilesa, Ibadan and Lagos have abandoned the road for alternative routes. A source, who escaped from the scene of abduction, told The Nation yesterday the couple was waylaid by the gunmen who fired several shots to scare motorists and commuters using the Ado-Aramoko-Ilesa Highway. The abductors were said to be six in number and they wielded sophisticated weapons. Our source said: “As they waylaid their car, the occupants of the vehicle coming behind them quickly ran into the bush to take cover. “They even shot into the air to scare us and ensure that we waited but we ran for our lives. The sprawling forest between Efon, a border town with Osun State to Iwaraja, an Ijesa town, had been branded beehive of criminals in recent times. Prominent indigenes of the state, including the State Financial Secretary of the Peoples Democratic Party (PDP), Kayode Oni, have been kidnapped in that axis recently.